As he entered Paris they showed him from the hill that splendour of new spires beginning, and somebody said something like, "How grand it must be to own all this." And Thomas Aquinas only muttered, "I would rather have that Chrysostom MS. I can't get hold of." Now that is why I read biographies of the giants of church history! I love stories like that. It is just a shame that G.K. Chesterton kept getting in the way of his subject time and time again in this book. I know that these are old criticisms of Chesterton, but I have never admittedly finished a Chesterton book before now. I am a big fan of his chapter "The Ethics of Elfland" in his book Orthodoxy but this is the first time I followed a complete narrative from beginning to end in a book by the man, and honestly - I hated it. G.K. Chesterton is great for quips and quotes, but trying to read a whole book by the man is frankly unbearable. There, I said it. Now that I've outed myself as a hater, allow me continue. 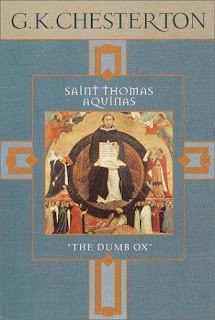 After meandering for the first two chapters of his book Thomas Aquinas, Chesterton gets down to business talking about Thomas' life - from his childhood as the dumb ox to his silence before God's glory, which made all of his writings "look like straw." I loved the book for the anecdotes about Aquinas' life, but Chesterton jumps around so much that it's hard to follow any real narrative. He makes a passing reference to his visit by St. Paul, but I wanted to know more about it. He assumes we know all of these stories - and maybe we do - but he writes at the beginning of the book that he's writing for novices of Thomas. Hence he should not assume that we know these stories! Either that, or he has changed audiences, mid-book! Yes, these are exclamation points. 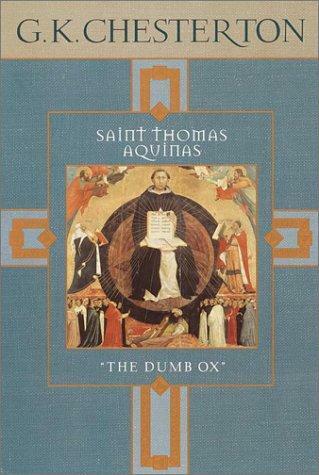 After the great example of St. Thomas, the principle stands, or ought always to have stood established; that we must either not argue with a man at all, or we must argue on his grounds and not ours. We may do other things instead of arguing, according to our views of what actions are morally permissible; but if we argue we must argue "On the reasons and statements of the philosophers themselves." I disagree, but will continue, because later Chesterton rips on Calvinists, and this deserves some attention. Later, again, it [Manicheanism] took the form of Calvinism, which held that God had indeed made the world, but in a special sense, made the evil as well as the good: had made an evil will as well as an evil world. On this view, if a man chooses to damn his soul alive, he is not thwarting God's will but rather fulfilling it. In these two forms, of the early Gnosticism and the later Calvinism, we see the superficial variety and fundamental unity of Manicheanism. The old Manicheans taught that Satan originated the whole work of creation commonly attributed to God. The new Calvinists taught that God originates the whole work of damnation commonly attributed to Satan. One looked back to the first day when a devil acted like a god, the other looked forward to a last day when a god acted like a devil. But both had the idea that the creator of the earth was primarily the creator of the evil, whether we call him a devil or a god. There are no Calvinists who teach the things Chesterton is saying. And the charge that Calvinism is related to Manicheanism in any sense is patently absurd. I suppose these are the sorts of slanderous lies which the Catholics like to bandy about regarding Calvinism. Either that, or Chesterton is intentionally misstating the beliefs of Calvinists. For there was one particular monk in that Augustinian monastery in the German forests, who may be said to have had a single and special talent for emphasis; for emphasis and nothing except emphasis; for emphasis with the quality of earthquake. He was the son of a slatecutter; a man with a great voice and a certain volume of personality; brooding, sincere, decidedly morbid; and his name was Martin Luther. Neither Augustine nor the Augustinians would have desired to see the day of that vindication of the Augustinian tradition; but in one sense, perhaps, the Augustinian tradition was avenged after all. It came out of its cell again, in the day of storm and ruin, and cried out with a new and mighty voice for an elemental and emotional religion, and for the destruction of all philosophies. It had a peculiar horror and loathing of the great Greek philosophies, and of the scholasticism that had been founded on those philosophies. It had one theory that was the destruction of all theories; in fact it had its own theology which was itself the death of theology. Man could say nothing to God, nothing from God, nothing about God, except an almost inarticulate cry for mercy and for the supernatural help of Christ, in a world where all natural things were useless. Reason was useless. Will was useless. Man could not move himself an inch any more than a stone. Man could not trust what was in his head any more than a turnip. Nothing remained in earth or heaven, but the name of Christ lifted in that lonely imprecation; awful as the cry of a beast in pain. Chesterton laments Augustinianism because it gave birth to Luther, whom he saw as a barbarian who knew nothing but emphasis. 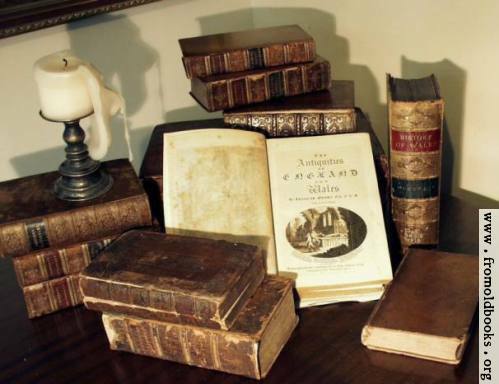 He spends some time at the conclusion of the book lamenting Luther because, in his opinion, Luther is the one who eclipsed Aquinas, who should have reigned supreme as the most important thinker in the history of the Christian church. I still love "The Ethics of Elfland," but I'm going to stop reading Roman Catholic histories of famous saints of the church and expecting them to read like Protestant biographies.